I used to own a children’s toy and book boutique. Picture books were a large part of my inventory and one my favorite product lines. I always had ideas for stories by being around picture books all day, but with three young kids, a store and a husband traveling for work, there was no time to learn about how to write them. When our family relocated to the Charlotte, NC area and I no longer had my store, I realized this was the perfect time to write. I knew that if I didn’t try to write my own picture books, I would regret it. I jumped into the kidlit industry and learned everything I could about picture book writing and publishing. I sent my sister, Becky Cattie, my early works to get her opinion, and was pleasantly surprised when they came back half changed (for the better). I asked her if she wanted to be my co-author and we’ve been a team ever since. 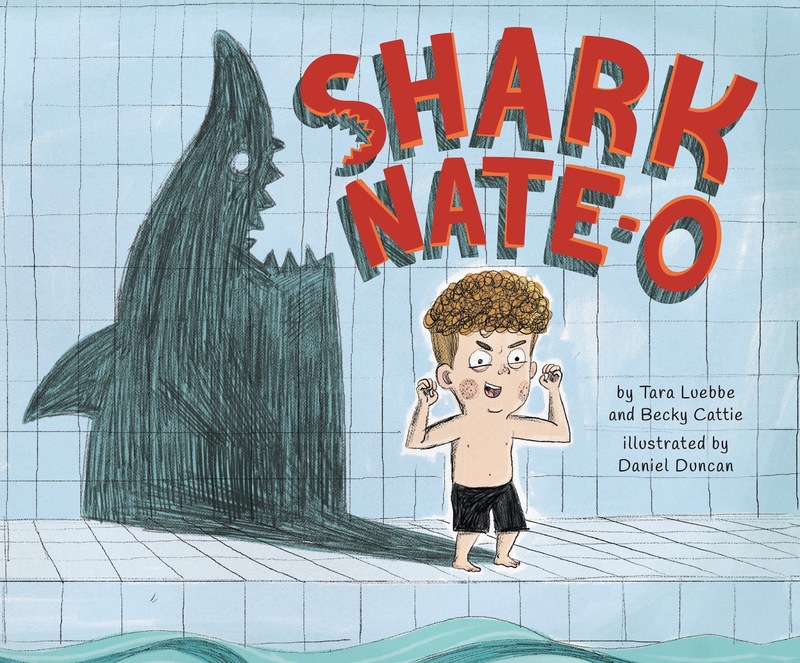 Congrats on your TWO debut picture books, I AM FAMOUS and SHARK NATE-O. Tell us about them and what inspired you. I AM FAMOUS is about a little girl who is convinced she is a famous singer, dancer, and actress because the paparazzi (her parents) are always following her around. The book was inspired by the Weird Al song TMZ. It’s a parody of Taylor Swift’s You Belong to Me and it makes fun of the paparazzi stalking minor celebrities. I thought it seemed very similar to how today’s parents document their children’s every move on social media. Plus, Becky was a little performer growing up, always putting on shows for our parents, so this character is very similar to her. SHARK NATE-O is about a shark-obsessed boy who can’t swim. In order to be a “real shark” he must take the plunge. He is overconfident at first because “sharks are born swimming”, but quickly realizes that he will have to overcome his fear and work hard to learn to swim. Shark facts are sprinkled throughout the text, and there is nonfiction shark backmatter as well. The book was inspired by a kid in my second-grade class who really thought he was a shark. He would try to chomp us at recess. But I needed more of a story than a shark-obsessed boy. My son Nate became obsessed with sharks a bit, too, and I found myself reading a lot of nonfiction shark books every night. Around the same time, he started swimming lessons. My brother began calling him Shark Nate-O and that was the bolt of lightning for the story (and my title). We put all three things together and … voilà. How did it come about that you are debuting two books within weeks of each other? Was your road to publication long and bumpy, or short and sweet? I have two books coming out around the same time because they both came from the same conference. My sister attended the Prairie Writers and Illustrators conference, run by SCBWI Illinois, in 2015. As part of the after-conference submission opportunities, we sent I AM FAMOUS to Wendy McClure from Albert Whitman and SHARK NATE-O to Sonali Fry from Little Bee. 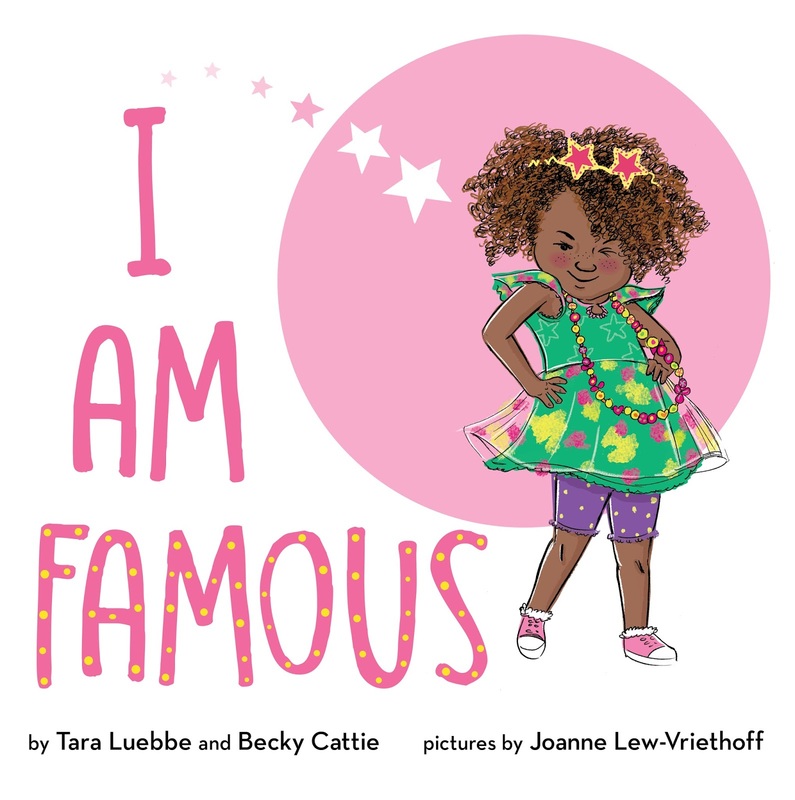 We heard from Wendy within a week that she wanted to acquire I AM FAMOUS but turn it into two books. And we heard from Sonali about two weeks later that she was interested in acquiring Shark Nate-O. So we sold three books from one conference which helped us sign with an agent, Tracy Marchini from Bookends Literary. Needless to say, that conference was a great investment! My path to publication was NOT typical. My sister and I started our journey in September of 2014 and knew very little about writing. By April of 2016 we had offers for three books, and an agent. By the end of 2017, we had sold three more books, two at auction. However, this just didn’t come out of the blue. I actually attribute a big part of our quick success to my years in retail which helped me really understand the children’s book market. The whole time I was buying and selling picture books, I was actually getting an invaluable education for my future career. But I was not so hot at the actual craft of writing, and it is still something I work on every day. Beautiful prose does not flow from my keyboard and I am not naturally gifted with words. The first thing I did was read Writing Children’s Books for Dummies. Then I joined SCBWI and went to as many conferences as we could afford. I took online classes and webinars. I joined 12 x12. I read the free resources online, like Tara Lazar’s blog. I took every chance to get my work seen and critiqued. I entered every contest I could. And then I won the opportunity of a lifetime—a 6-month mentorship with Stacy McAnulty. Don’t get me wrong, this was not easy and I worked my tail off from the minute I decided to do this, but I was also lucky to have early success. I know it is not typical and I am thankful to be where I am in such a short amount of time. I always have a bunch of manuscripts in various stages of development. I still have my very first story, sitting in a drawer. I am convinced the concept and idea is good, but I still need to find the right angle. Currently, marketing our two spring debuts has taken over my life. We have two more books coming out next year: a sequel to I AM FAMOUS titled I USED TO BE FAMOUS, and one more book with Albert Whitman titled OPERATION PHOTOBOMB. CONAN THE LIBRARIAN will be released in spring 2020 by Roaring Brook Press. I am looking forward to the launch season calming down a bit so I can focus on writing new stories. Be proactive and take every opportunity you can: every conference you can afford, every critique, every contest, every craft-learning session. Don’t let opportunities go by because you are too busy or it seems like too much effort. You don’t know what is going to be the catalyst for you. I wrote an article on “taking your shot” here. I would also say to heed my Storystorm advice and learn to embrace marketable concepts. The fastest way in through those closed publishing house gates is to write a high concept and marketable story. I am living proof of this. Also, read current picture books. I realize not everyone can afford to go to conferences, but reading picture books is free and the absolute best education you can give yourself. Take this part seriously and make it a weekly habit. This helps you understand what is selling, what works and sometimes what doesn’t. I would recommend a goal of reading 12 new releases a week from the library or a bookstore. See if your library participates in Wowbrary.org. If so, you can sign up for a weekly email that shows new purchases made by your library. You can just click them off the list to add to your later or hold shelf. This makes it very easy to keep up with new releases. I keep a huge “wish list” in Amazon that I use as my “to read” list. I try to get as many as I can checked off the list from visits to local stores or the library. Well I’m not sure this isn’t well known after this past year, but I am the founder of Writing with the Stars, a free mentorship program for aspiring picture book writers. 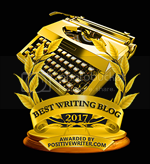 The contest just wrapped up its second year and we gave away 16 free mentorships with published authors. We will do it again next year and the line up for 2019 will be announced in December. All of the information is on my website www.beckytarabooks.com. I just started using Instagram: at taraluebbe, (I am really terrible at it and still learning this one). Tara Luebbe is an ex-retailer turned picture book author. She co-writes with her sister Becky Cattie. They are the authors of I AM FAMOUS, illustrated by Joanne Lew Vriethoff; SHARK NATE-O, illustrated by Daniel Duncan I USED TO BE FAMOUS, illustrated by Joanne Lew Vriethoff (Albert Whitman spring 2019); OPERATION PHOTOBOMB (Albert Whitman fall 2019) and CONAN THE LIBRARIAN (Roaring Brook Press spring 2020). 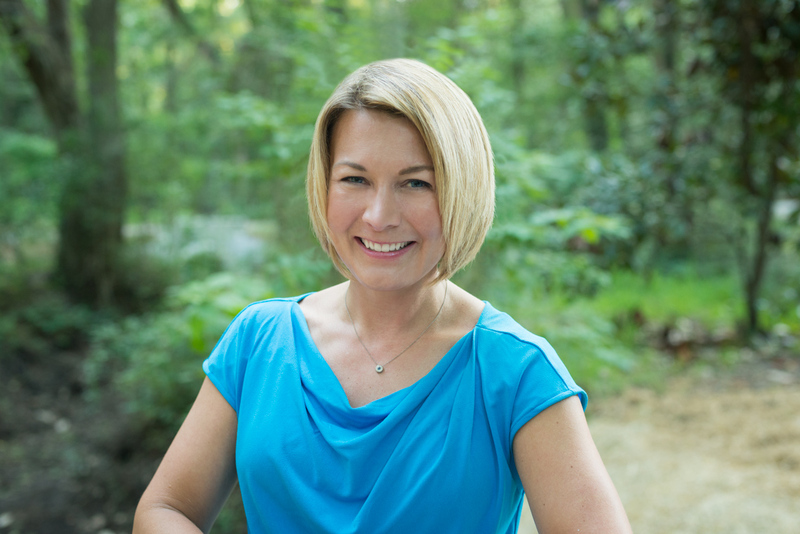 She is also the founder of Writing with the Stars, a free mentorship program for aspiring picture book writers. What an incredible journey you’ve been on! So happy you for all of your well earned success! Thanks Jodi! I loved Where are the Words! Thank you for the tips! I'm excited to read your new books. Congratulations Tara and Becky! You really hit home with using every opportunity afforded to learn and submit. Looking forward to reading your books. Much success to you both! I won a spot in this year's WWTS and so far my mentorship has been AWESOME! It's been such a huge influence on my work, and I can't wait to share with you the progress I've made when we wrap it up at the end of this month. :D Thanks so much for organizing, Tara, and congratulations on your books!! These both look charming and humorous! Wow, great interview! All those years of reading paid off. Sounds like I have to get more in line developing a book with a hook. Thanks for the wisdom! Tara, you are always full of good advice and generous in helping others. Thank you for Writing With The Stars. I just signed up to follow your blog as I love the idea of the mentoring contest and this is my goal. 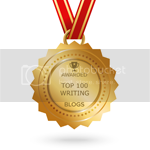 Thanks for all your advice and help for writers. Tara, Thanks for sharing and giving me the opportunity to follow in your footsteps. What a great post! Thanks for sharing your journey. Looking forward to reading your books! Congratulations Tara and Becky!! Congrats Tara and Becky! Thanks for sharing your journey! I enjoyed reading about your journey and I think it's wonderful that you're a team with your sister! Weird Al! I'm dying. So fabulous. Great post for sharing your journey. Thanks. Can't wait to read these books!